(TibetanReview.net, Dec06, 2016) – The executive head and the parliament speaker of the exile Tibetan administration at Dharamshala, India, on Dec 5 called upon the UN High Commissioner for Human Rights to raise the issue of China’s ongoing destruction at Larung Gar, possibly the world’s largest Buddhist leaning centre, located in Serta (Chinese: Seda) County of Sichuan Province, during the 34th session of the UN Human Rights Council to be held in Geneva in Mar 2017. Addressing a joint press conference at Dharamshala, Sikyong Lobsang Sangay and Speaker Khenpo Sonam Tenphel also called for immediate intervention to halt the destruction while also seeking urgent attention to the “critical human rights situation in Tibet”. Since the destruction – ordered directly from Beijing – began in July, some 4,600 student monks and nuns have been evicted and sent home while around 1,500 of their residences were demolished, said the exile Tibetan administration on its Tibet.net website Dec 5. The report said the Chinese government’s goal is to downsize the academy by 50 percent and evict at least half of its more than 10,000 residents. Religious leaders of Larung Gar had reportedly been ordered to bring down the number of monk and nun students to a total of 5,000 by Sep 2017. 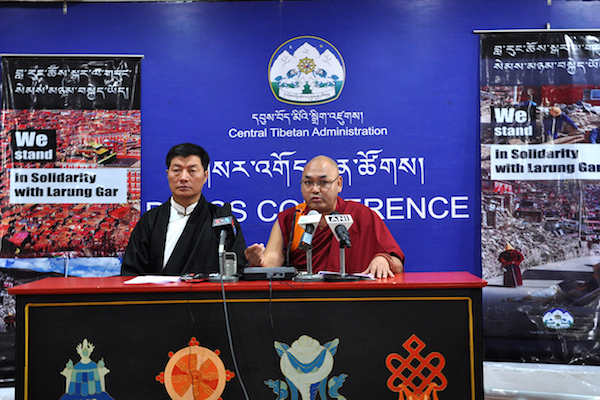 A seven-minute video titled ‘We stand in solidarity with Larung Gar’, containing bits and pieces of audio-visual grab of the ongoing destruction and its emotionally devastating effect on the monks and nuns was also released at the press conference. Information about the scale and depth of the ongoing destruction remains highly difficult to obtain due to China’s tight control on communication channels and flow of information. Three nuns, named as Rigzin Dolma, Tsering Dolma and Semgam, were said to have committed suicide, leaving behind notes that expressed their inability to live with the traumatising experience and effect of the destruction. The video is said to show scenes of nuns wailing as they watched fellow-nuns being shoved into buses to be taken back to their home towns where they will be subjected to patriotic education sessions. Another video grab is said to show nuns being forced to give pop music performance on stage as a way to humiliate them. A petition titled ‘Stand with Larung Gar Now’, initiated by a group called ‘Safeguarding Buddhism’ is to be delivered to the UN Human Rights Council on the World Human Rights day of Dec 10. More than 1,47,000 people have already signed it and the exile Tibetan administration urges more people to do so. The UN rights chief, Prince Zeid bin Ra’ad Zeid al-Hussein, has been seeking to visit Tibet and China over the past several years. But China has so far failed to let him in.